How to create a fire evacuation map for your business. Are you considering creating your own fire evacuation map for your business? If so, here are some questions to ask yourself before embarking on your first evacuation mapping project. What do I know about emergency evacuation planning and egress routing? Do I know and understand the codes and requirements? Will I have time to do a good job? Do I have the right illustration software and illustration skills? Will the project be hard to manage because of complexity or number of buildings? Most Importantly. Will employees and visitors be able to evacuate the building based on my evacuation maps? If you are concerned about the safety or time it will take to create evacuation maps for your company or organization, consider contacting a professional evacuation mapping company. The three steps to create evacuation maps for your business are: Plan, Illustrate and Install. Planning for the emergency is the most important aspect of creating safe fire evacuation maps for your building. First determine who (what authorities) has jurisdiction over your business and building. Then determine the evacuation mapping requirements of those authorities. Authorities that can mandate requirements are called ‘Authorities Having Jurisdiction’ (AHJ). Take the information you gathered from your AHJs to create your evacuation maps. Understand that you will often be combining the requirements of a variety of AHJs when creating your maps. Often fire code or OSHA code will only give general requirements for the evacuation maps. Items like fire extinguishers, fire pulls and AEDs may not required but would be good to have on your maps. First, make sure to include what is required by all of your AHJ’s. Some of requirements might be listed below. A ‘You Are Here’ location. This indicates where the map you are viewing is located. Fire extinguisher, fire pulls, first aid and medical defibrillator locations. An Assembly Area. This is a place to meet outside and away from the building, after exiting the building. A legend that illustrates and explains your map. Once you know the requirements you can then add information that might be useful to your specific building or business. This might be emergency phone numbers or special instructions. Your fire evacuation maps must be both accurate and easy-to-read. Your evacuation maps must be accurate when they are created and then kept up-to-date. Incorrect or missing information is a danger to life safety. Take your time, to do it right. A common mistake is to make evacuation maps that are overly complex or that have too much information. 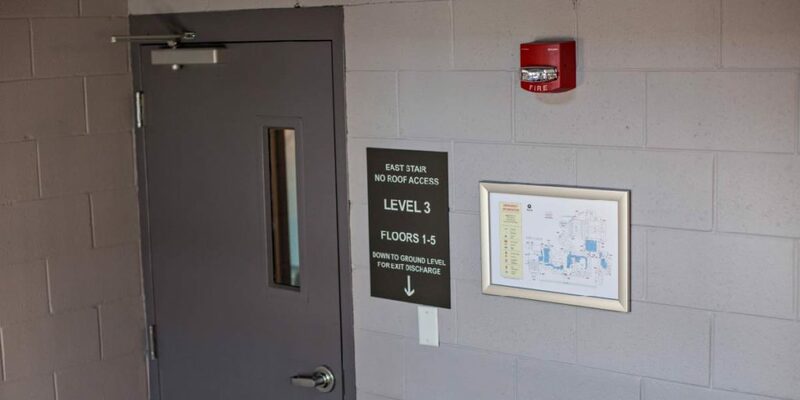 Keep in mind, that the main purpose of a fire evacuation map is to instruct how to egress out of the building in an emergency. Everything else is secondary. First draw the walls and doors of your building. Next add specific details such as the ‘You Are Here’ location, primary and secondary egress arrows, fire extinguisher locations and all other detail. Now add a compass arrow and street names outside of the walls of your building. ‘Orient’ the maps to the exact direction a person is standing, when viewing the map. The top of the map should be in a forward walking direction. Finally, review your maps with those in your office. Then review that your drawings meet all AHJ requirements. Where you should hang your evacuation map frames or holders might depend on AHJ requirements. If not otherwise indicated by your AHJ, you should have an evacuation map in each room that people regularly occupy, in the hallways. Your maps should be permanently attached to the wall. This article provides a basic guideline for creating evacuation maps for your building. Requirements vary, so contact your AHJ or evacuation mapping professional before beginning any evacuation mapping project. Tony Jones, CFPS is the owner and founder of Building Maps. He is a fire evacuation mapping and code compliance expert. You can learn more about Tony’s work here.